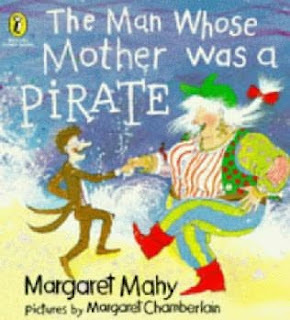 I loved the idea of the pirate mother and her son setting off to the seaside with a wheelbarrow and a kite. I enjoyed the humour of the son’s boss admonishing him to return soon or he would replace him with a computer. There’s a lot of fun and adventure within the text. This is a story children will want to hear again, then read for themselves. Margaret Mahy is a master of the picture book form. First published by J.M.Dent & Sons in 1972, my edition was reissued by Puffin Books in 1985. Margaret Chamberlain’s illustrations rollick along with the story, highlighting the difference between the flamboyant pirate mother and her respectably brown-suited son. Her side of the table is bursting under a load of baked beans, sausage, egg, chips, kettle, condiments and a parrot, while he sits down to a boiled egg with a slice of bread and butter. If you’ve ever wanted to be a pirate, to dance “hippy-hoppy-happy hornpipes up and down the beach”, if you love the sea, the glory of salt spray and the drum of the breakers, then this book is for you. It’s a masterpiece of a picture book. Book Chook Reminder: Share a Story -Shape a Future, March 9-13, 2009.